So I've been floating the idea of pooling resources and perhaps doing something ourselves. My understanding is there's to be no effort from our previous organizers. I do commend them for the efforts that they put forth in the years past, but unfortunately due to bad weather and other issues, I think it cast a poor light on the event and ended up causing them some unfortunate prpblems. That said, I don't even know where to begin. I definitely like the venue as it provided us with a strip, road course and room for autocross courses. Personally, I'm a road course kinda guy with a little flair for the strip, but setting up an event of this magnitude is WAY over my head. So, if there are interested parties that are willing to put some time and effort as well as securing some funds from local clubs, then I think that we can put something together ourselves. But if we're to secure that date, we need to do it very quickly if it's not too late already. I'm mainly intrested in hearing from club presidents/owners/etc, especially Northstar, Mi, Indy and St. Louis. Others are encouraged since I know there were some East Coast folks that have attended. Any West Coasters who organize Sevenstock please chime in to lend some experience. So, discuss and let me know what you think. A few things that would also be nice. Four of five of those were present at the last one or at least have been at previous ones. Seems like the local vendors would want to get involved. Some of close guys are A-Spec, BanzaiRacing, RX-7 Store, and of course AIM Tuning. I wish I could help more but I have never set something like this up either. I am also an hour and a half north of Indy. Kentucky Speedway. Inbetween Louisville and Northern Kentucky. thats all i know in my tri-state area. but it all boils down to MONEY MONEY MONEY. I'd set it up if I could, but I know I can't afford to pay it if the event fails for any reason and huge loss of revenue happens. I spoke with a gentleman from IRP who did the Rev things. I'm going to send him an email tomorrow and he'll give me a quote. I can tell you that 7/7 is already out as SCCA has an event that weekend and have had that weekend for 17 years apparently. SO...that said, IF it were to be there, it wouldn't be that weekend and if it's going to be that weekend... He's gearing up to start the scheduling for '07 so time's a wastin'. Hey, just caught your post on the NRR forums. I've actually never been to a Revo, because they were always too far away. The only place I know of that you could run something like this without it being mad $$$ is MAM. 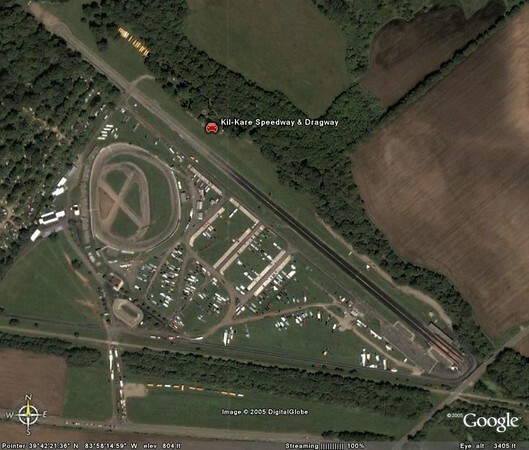 They have a big parking lot, road course and 1/8 mile dragstrip all in one location. It's kindof out in the sticks though, so it might not the best location for a revo style event. Have you seen prices yet for the other places you have listed? Too far....BAH... as far as you guys drive around. The rough price that I had was $5,500, but I think that I'm confused as I don't think that was the weekend but per day, but I have to confirm that. I haven't looked at any other places as of yet but rest assured I will be contact them all shortly. The problem is getting something for everyone and IRP is the only place I know of in the region that can accommodate that. Personally, I've never been too fond of the 1/8. I don't know what other's thoughts are. Perhaps I can find a way to work in a deal with Rt 66 and Autobahn, but the problem is that Autobahn is really expensive, and again, this is a bad weekend too due to the obvious proximity to the 4th. But I will follow up with all the suggestions and they are very much appreciated. Haha, ok... too far for a non-competition event. In any case, I can see why IRP is a good fit, since you're trying to draw alot of east coast guys too. $5500 is probably a daily fee yeah. At that cost you're going to need ALOT of attendees. Not out of the realm of possibility though. I would think by allowing vendors to setup tables we could raise a good deal of money and the rest could be through admission prices. Hell I know I would be willing to pay 100 to be able to participate in all that IRP offers. Maybe not all in one day though. I don't work there, but I'm family friends with the Owner. Well i have only been to one revo in the past but i would love to see it keep happening, should we mabye for some sort of a comitee or something to organize an outline of what we need to do? Last edited by E Dogg; 10-03-06 at 03:21 PM. Heh...being in IA, there's a former owner around there somewhere you can kick around for a while for selling. He still shows up every now and then and he knows who he is. The committee is a good idea and if you know how to use a phone, then it doesn't matter where you are. It's all about location location location though and I don't want to put it too close to another event. Yes, ideally 7/7 would be the weekend to do it, but again with the 4th right there it's going to be tight. I've tried to send an IM to Ryan, but he never...ever replies. How about Lupe...what's around Gateway? You've been to both. What's it like compared to IRP? Looking at the track map, it looks like there's an infield course that could be a road course. Is that the case or do they just use the oval and is there enough space for some auto-x? I'll look into MAM too, but again, the 1/8 might be a killer. Any other ideas as to locations in the Midwest region that can support both on the same campus? So mabye see how many people are needed to organize everything- break the to do list down and have everyone work on thier strong area/s. Well my main idea is to approach this is somewhat of a business, see how many there will be in attending; predict the expenses, come up with a budget etc... not that im saying a profit needs to be made, but if everyone involved has to start digging in their own pockets it wont be too much fun. Alsothe more accurate of numbers etc that can be provided for vendors, i feel they be more inclined to show up and pay for spots. And of course publicizing the event early and often will be key also- the sooner people know for sure its going to happen, the more time they get in advance to schedule around it. Dogg you are exactly right, this has to be done as a business venture, and it can be done profitably if planned, scheduled and managed as a business. Who's up for a meeting to establish a business plan. If this happens, I plan on organizing a Mile High Rotary Club trip to attend this. 7-7-07 should be a big deal since it happens to land on a Saturday and has all 7's in the date! We have a total of 103 active members and growing so getting a group of 20+ may be very possible. Let me know if you could use any help on organizing this. I am personally interested in working on this and will try and bring it up to our club who has a social event this weekend and see what the interest level is. So lets have a meeting guys, what is central or should we just go to Indy to see the site and make plans. i think we should do a little bit of phonecalls/emails etc before we meet.. so at least we can have a specific agenda and plan on what needs to get done. One thing i just thought of is insurance, does that come as part of the rental or does that need looked into seperatley? Im guessing the logistics of the insurance, and waivers for all the drivers would need to be handled by the event organizers, and the location's owners most likely have requirements for this to protect themselves and thier property. Also, if the other owners sold thier stake in Revo; who if anyone, owns it now? Gateway would be a great location. We held a event here a few years back which included Pettit Racing and RX7.COM and it turned out fantastic. I'm glad this is picking up steam. First, as far as the stake in the whole thing, I can't get in touch with either Mike or Aron. Neither of them will return calls or PMs. I think I know why and that's ok, but at least SOME acknowledgement would be nice. Next, their site is dead. The original was revolution marketing and later changed to lat-g.com, Lat-g is now one of those domain sitting sites so...as far as the name...well, this isn't any fault of the organizers, but with the bad weather associated with it, perhaps a new name would be better. Additionally, as far as I know, the name was never trademarked nor was the whole thing incorporated so...but that's easily confirmable with just a few calls. LUPE...answer my question!!! What about the infield at Gateway? Is it a real road course that can be used? Mike B, I agree 7/7/07 is the date to have this on, but again I fear that it would have to be a location off track as that's already going to be a big weekend. Keep in mind, the following year would be 8/8/08 so naturally if this panned out for 07, that would be the date for the following year's event, then after that it's flexable. Insurance is typically extra and depending on the venue, it may need to be a $500k or $1M policy. And yes, any waiver is again typically handled by the organizer, though some places (Autobahn and Gingerman to name a couple) have their own waivers. As far as a meeting, well, I suggest something on line...either a chat or a conference call, though a voice chat will be better as things will be written down on the fly and we can all instantly have a transcript of that. The rest of this week is already shot for me, so how about putting something together for Monday? I don't think anyone will want to do anything this weekend. We can get a pretty good agenda from this thread before a meet took place so. should we all put toghter and agree on a high level overview of what needs to be sorted out and in what order? This is the current road course. The facility is huge and it's very nice.